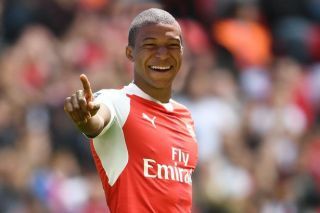 Paris Saint-Germain superstar Kylian Mbappe has revealed he never really came that close to a transfer to Arsenal back in the summer of 2017. The France international ended up moving from Monaco to PSG in a somewhat surprise deal that summer, joining on an initial loan to the team he’d just helped Monaco beat to the Ligue 1 title. Much speculation at the time had linked Mbappe with Real Madrid and with a possible move to the Premier League, with Arsenal seemingly one of the surprise candidates in contention. This would have been extremely out of character for the Gunners, who are rarely among Europe’s biggest spenders and who don’t really look an ideal destination for elite players right now anyway due to not winning a Premier League title since 2004 and rarely being anywhere near contention to win the Champions League. Still, Mbappe has been quoted by Arsenal reporter Charles Watts as saying he did have some talks with former Arsenal boss Wenger, though he may have already decided at that time to make a different move. "We were in touch in 2017. I’d chosen a different path, and he didn’t hold it against me. He was a gentleman and wished me good luck."